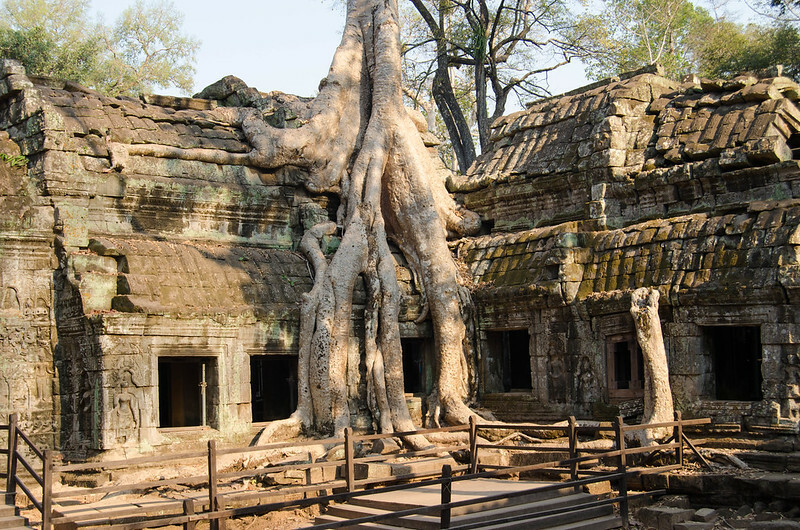 Siem Reap is the starting point to explore the Angkor Temples, see it as your headquarters. Read more about it here. The city offers you different options to do so at different price ranges. You can do it by yourself on a motorbike or bicycle, in group tours, or by tuk-tuk – 25USD for a whole day, granting you a ride to all the main temples and back) – just as a warning, we saw a girl making a big scene after realizing her tuk-tuk abandoned her in one of the temples. 2 bikes for 2 days cost 6USD. 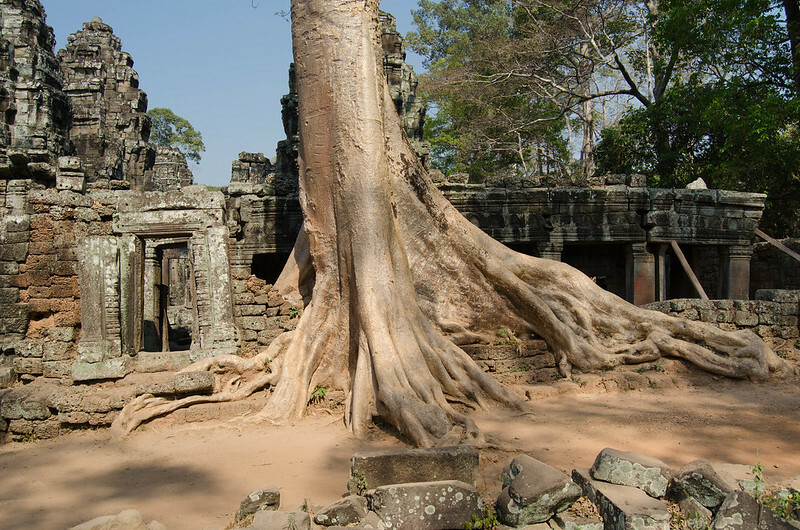 The temples are inside a beautiful and very well maintained park, with huge trees and vast vegetation where insects sing from. Locals come here to relax, swim and have picnics on the weekends. After 35 minutes through the long straight road, we arrived at the Angkor Archaeological Park purchasing our 3 day passes. Once you’re there, you’ll have a photo taken and be given a pass/visiting card that you must carry at all times. Every day, as you enter the park a guard will check it. – No problem my friends, you put the bicycles in the tuk-tuk as well. After Cycling for other 15 minutes, we arrived at Prasat Kravan, a small temple made of three red-ish brick towers and surrounded by a dried moat. The temple is in pretty bad shape but is still possible to see the bas-reliefs dedicated to Vishnu. That same day a bunch of people was arranging what appear to be a wedding reception: carpet, fancy chairs, and bamboo lamps decorated the place. So even though it spoiled the scenery, it’s good to know that you can get married there if you want. Quite cool! 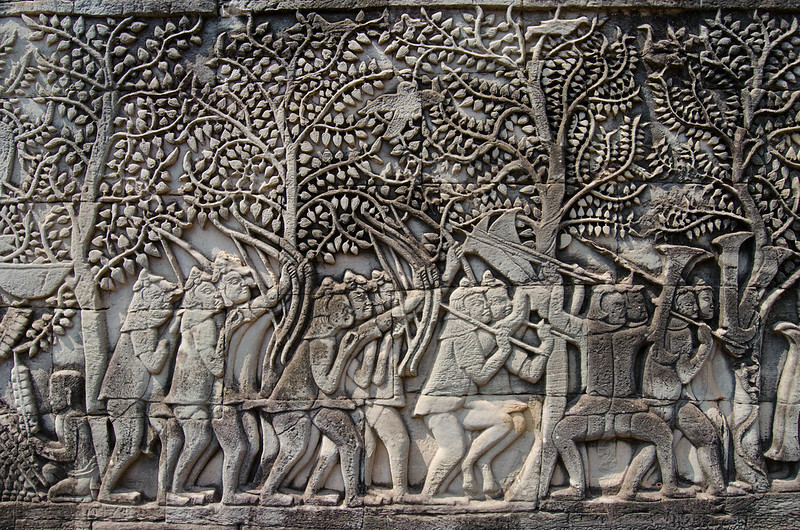 Reaching Banteay Kdei, the second temple, took another 15 minutes. The temple is surrounded by a wall, like most of them are. We got in through a narrow and detailed doorway and walked along a stone road before reaching the main building. Parts of the building have collapsed, but most of it is visitable. It is astonishing to think about the work behind all that: the transportation of all that raw material, the skilled men that cut the stone to fit impeccably together and the sculpture work all throughout the building. Nowadays the fallen stones are organized in piles (for inventory) and several walls are now supported by iron and wooden beams. 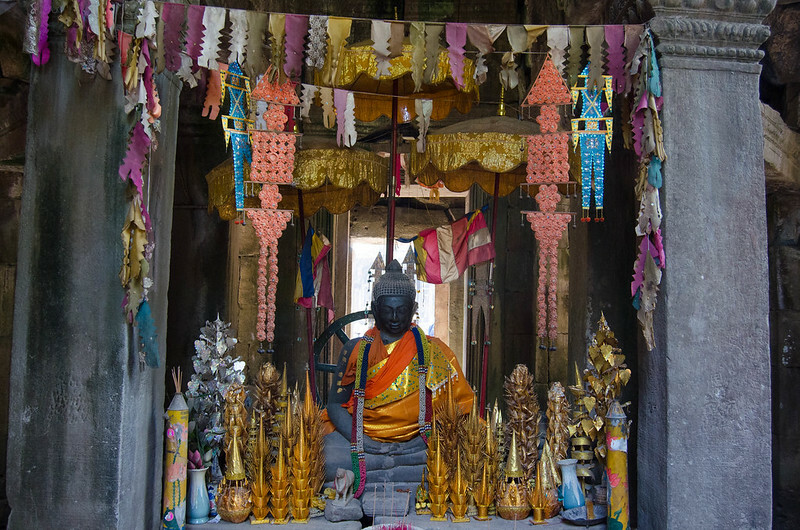 The Angkor Temples are still visited as religious sites as well: you can find Buddha statues decorated with gold and orange cloths with incense and offerings laying at their feet. In a way, the temples are still alive and serving their purpose. In front of Banteay Kdei is an enormous lake – Sra Srang – used by the crowned heads back in the day, for bathing and playscape: a bathtub to fit their egos. As we said in past posts: when everybody else is having lunch you can have a more private experience in touristic sites: no tour buses, more silence, better photos! While you’re enjoying yourselves, everybody else is eating so it’s a win/win situation. At the temple complex food and drinks are way more expensive than in Siem Reap, three times more expensive, so be prepared and stock up! Along the park, you’ll also be approached by children trying to sell you bracelets and postcards. 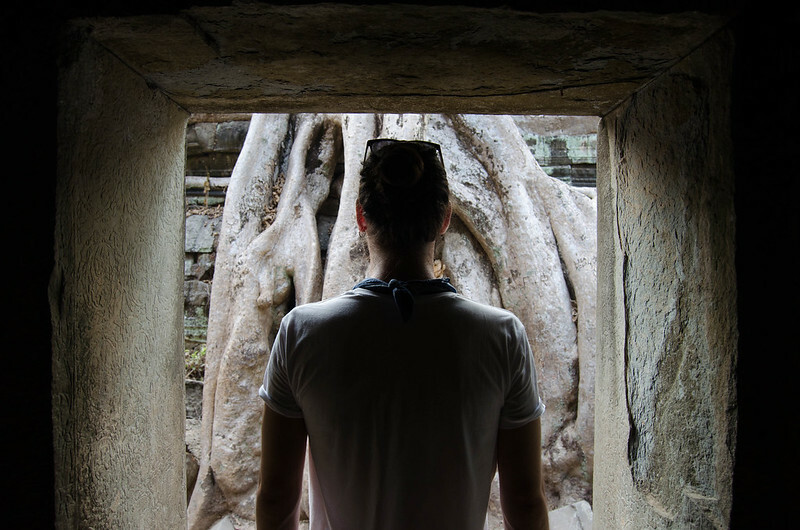 After lunch, we headed to Ta Prohm, one of the most recognized temples by the general public due to the Tomb Raider movies. Here, nature took back the place. Giant trees with a magical golden bark grew on top and around the walls finding a beautiful balance between weight and support. Pure magic. No one knows who’s holding whom. By 5:30 PM we headed back to the city. The park closes at 6:00 PM. The second day as we biked to the park, a bunch of monkeys welcomed us by the road, it was our first time seeing monkeys in their natural habitat. We knew it was going to be a great day, we’ve just seen monkeys and we were about to visit the BIGGEST TEMPLE IN THE WORLD: Angkor Wat. 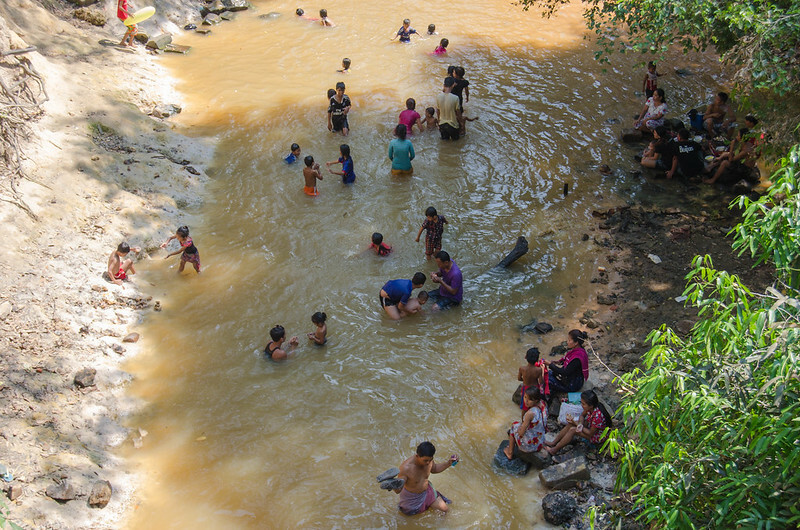 Surrounding it is a moat the size of a river and the only way to reach the temple is through a stone passage. At the start of this passage was a frenzy of people, locals, tourists, tuk-tuks, buses and food carts. We were hoping to be the first to arrive. Not! As soon as our eyes got through the wall of people, we faced the massive Angkor Temple in all its glory, right there in front of us, bathed by the morning light. Wow! Just as seen on TV. The temple is completely symmetrical, long halls, galleries, and aisles serve now as the background of every tourist profile photo on facebook. There are stairways to climb and empty stone pools on the top. 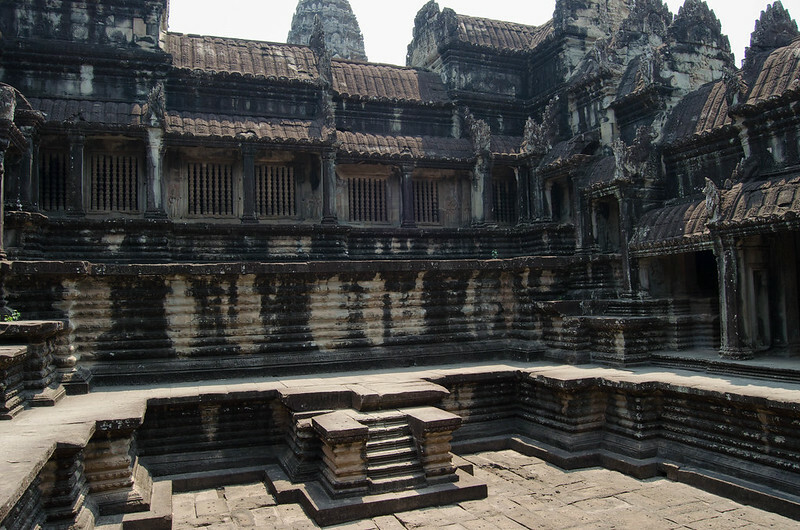 Ok, I’ll say it: Angkor Wat is overrated. Yes it’s the biggest and the tallest and the view of the park is epic once you climb the central section, but that’s pretty much it. 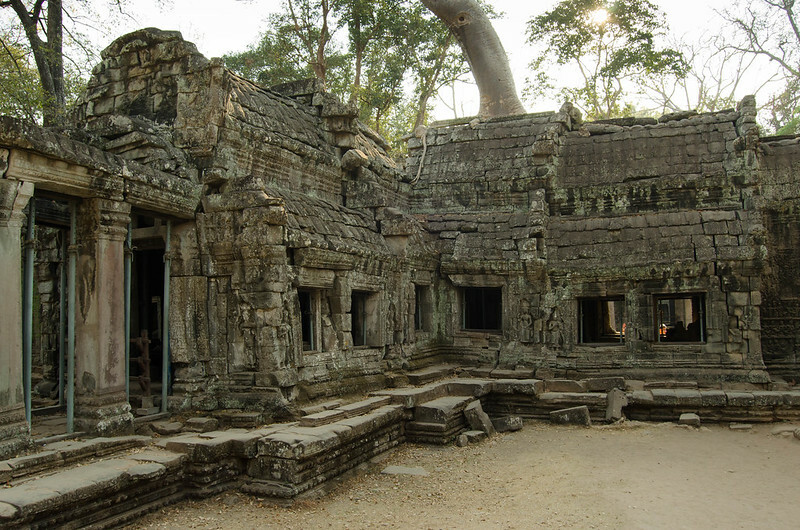 There are smaller and worst kept temples with better sculptural detail and a magical ‘je ne sais quoi’ that we didn’t feel in Angkor Wat. It felt a bit sterile and dry compared to other temples that time managed to marry with nature. During our visit there, a young fellow dressed like a pimp – all white and pastel colors with a pimp cane – arrived. He had an entourage that only walked behind him and one of them held an umbrella so the pimp would be in the shade. They walked in, got to the Buddha statue in the center of the temple, turned they own sound system and prayed. A true baller. After having lunch at one of the restaurants on the side of Angkor Wat, we biked under severe heat to the old town of Angkor Thom: it’s a giant walled area with several temples inside. The north and south entrances are flanked by imposing statues of men battling demons. 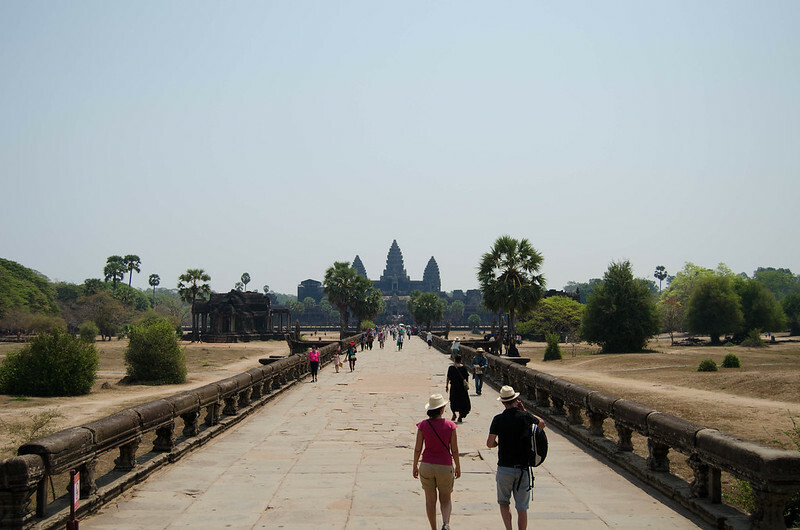 Minutes after passing the moat and the entrance, we reached other of the most recognized temples in Siem Reap: Bayon. 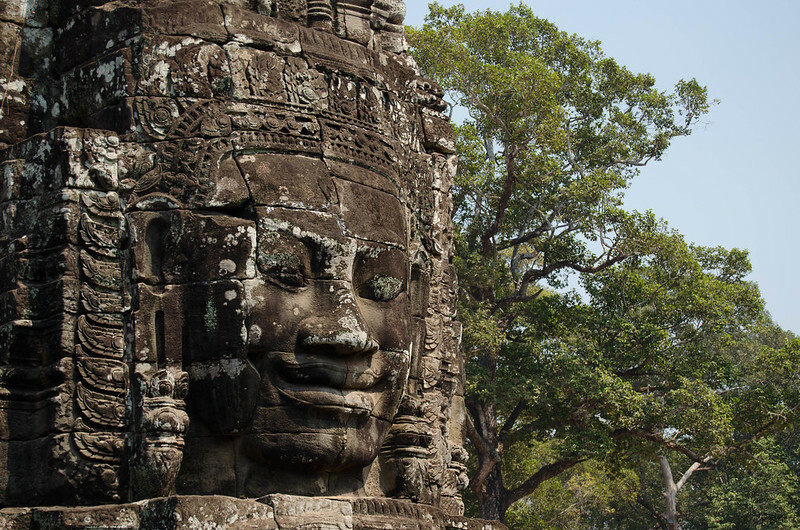 It’s the one with many faces — 216 to be exact — built by a king that wanted his face sculpted everywhere to impose respect on anyone observing the temple. 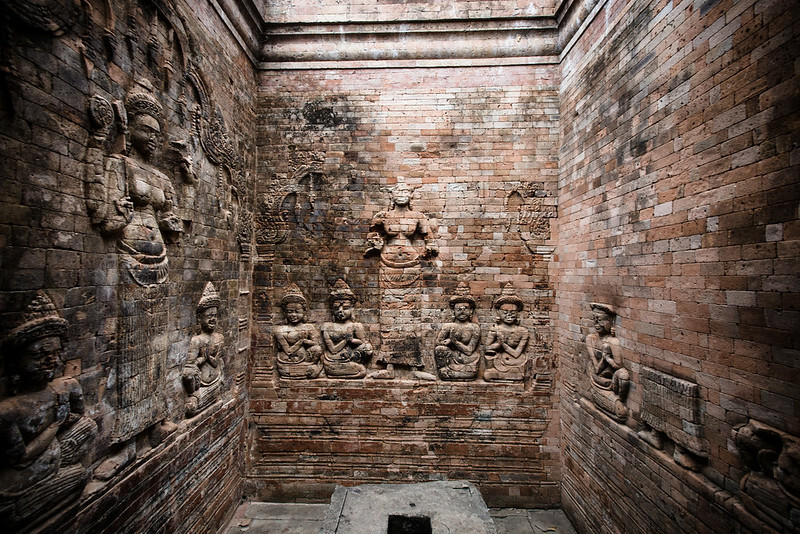 Other amazing features are the extensive, well-conserved bas-reliefs walls portraying stories of battles won and Khmer everyday life. More to the left is the Baphuon temple in which we didn’t get in. The fatigue and the heat dissuaded us from climbing the 5 or 6-meter platform where the temple seems to be built on. To be honest, we were feeling ‘templed out’ and regretting choosing a bike as transportation. Just the thought of all the kilometers still ahead of us made us want to cry. We decided to sit in a shaded spot and groan in anguish. 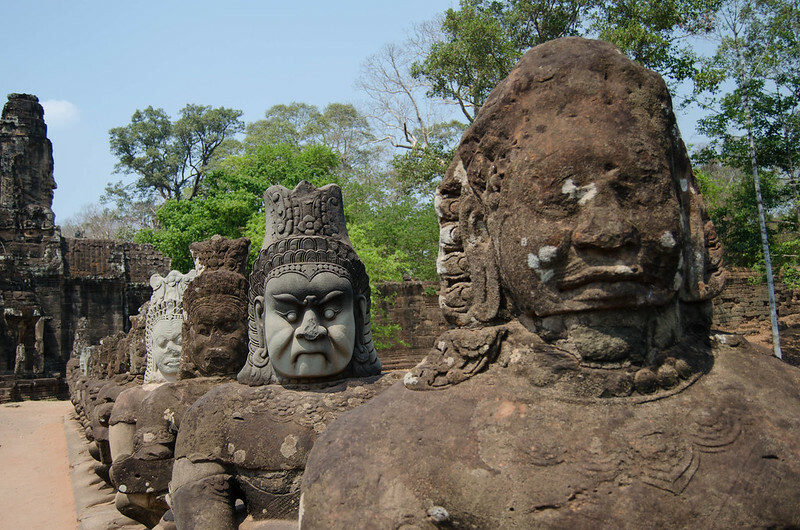 We left Angkor Thom and headed to the temple Preah Khan: it once served as a town, temple and Buddhist university. Nowadays the trees that grew around it are the ones that teach. 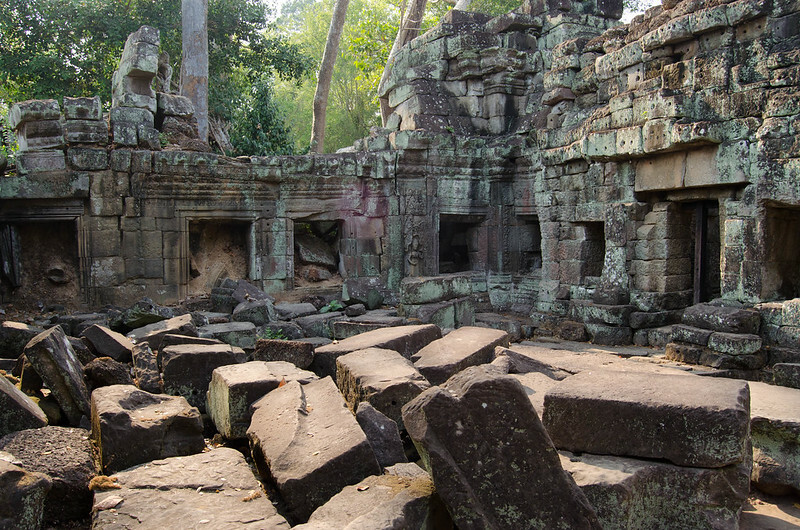 The restoration work in Preah Khan was minimum, being purposefully left as it was found. 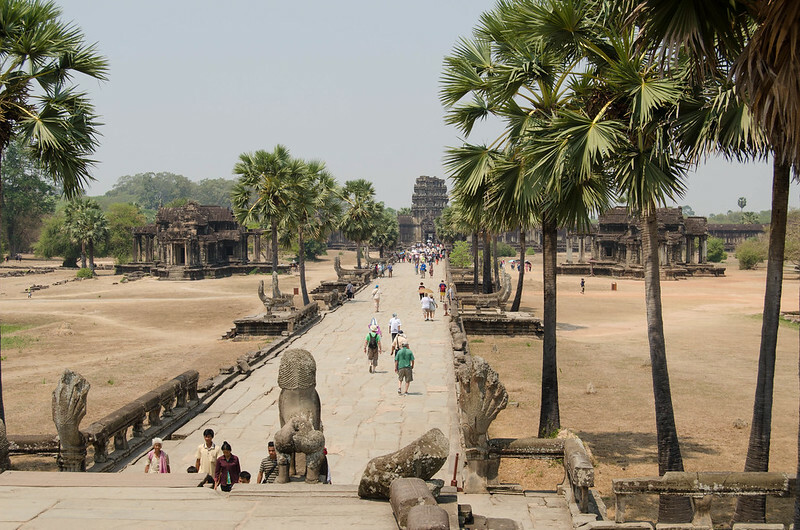 Talking about ‘restoration work’, we were able to see that the main benefactors to the Angkor temples restoration are Germany, India, and Japan. Thanks for caring about the World Heritage sites! Or is there another reason? Having to go all the way back to the hotel by bicycle was actually the best thing we could have done – It gave us time to reflect and absorb what we’ve had witnessed and to say goodbye to Angkor as the sun went down. What an amazing experience: two full days witnessing epic history and actualized human badassery that will certainly remain in our hearts forever. Way longer than the pain in our legs.